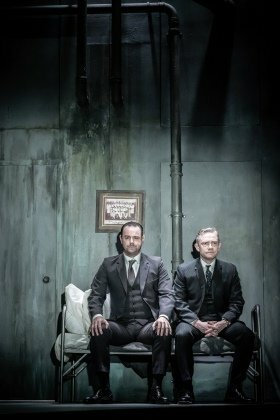 Danny Dyer and Martin Freeman in Pinter Seven. Photo credit Marc Brenner. The clipped tones of Flora (Gemma Whelan) and Edward (John Heffernan) in A Slight Ache almost called to mind the Noel Coward comedies. This being a Harold Pinter play, it doesn’t quite match the rapidity and breeziness of Coward but is very much in the mould of the ‘Pinter at the Pinter’ series: the surrealness begins fairly early on, as it does in The Dumb Waiter which follows. There is a match seller outside this couple’s house, but he does not speak, inasmuch as he does not have any lines in the play. It is entirely possible to have had an actor play the said match seller on stage, though this production chooses not to, framing the performance as ‘a radio play’ (which it originally was, first broadcast in 1959). Indeed, the production goes to town on the whole radio play thing, with a recording studio set complete with ‘On Air’ sign, wall clock, microphones and so on. it works well, providing an amusing extra layer of amusement with sound effects, such as, for instance, Flora going out into the garden and back again: there is no garden to see on stage, only the crunching footsteps on gravel. Flora is spoken to tersely on more than one occasion: arguably the most severe case is when she is barked at to “get back to [her] trough” (whatever that is) – the play dates back to an era when the Lord Chamberlain still exercised censorship over theatre scripts. The dialogue is therefore rich in vocabulary, coming from a time before ‘eff, cee and effing cee’ became common. That the match seller remains an unknown quantity means that, as would be the case if the audience really were listening to the play on the radio, it’s not entirely clear if the match seller is ‘real’ or a figment of Edward and Flora’s imaginations. “A woman will often succeed, you know, where a man must invariably fail”, muses Flora. Edward and Flora bicker in the way in which people who have lived together for at least a quarter-century tend to do. But neither actor (both are still in their thirties) quite convinces in terms of looking like characters who have endured enough of one another’s company that they would have an argument over precisely should be done with a wasp that has joined them at the table for their meal. Then again, that a young couple should converse in such a way adds to the relatively enigmatic nature of the play. There’s an unseen third party, too, in The Dumb Waiter, which I found more comical than A Slight Ache. Ben (Danny Dyer) and Gus (Martin Freeman) are in a basement room, gig economy workers long before the term ‘gig economy’ became an entry in English dictionaries. It is perhaps worth mentioning at this juncture that Dyer has referred to Harold Pinter as his ‘mentor’, and Pinter had previously cast Dyer in productions of Pinter’s plays. As far as this production of this play is concerned, the duo are waiting around for their next job, with a wide-ranging conversation taking place between them in the meantime. The build-up is steady and assured, and the final moment of the play is surprisingly hard-hitting. For reasons that remain ambiguous to the end, there’s a dumb waiter (or food lift) in the room, and there are repeated uses of it. Someone keeps sending down food orders, even after Ben and Gus have made clear there isn’t any food downstairs. There are not many plays and not many playwrights that could bring the house down with “Scampi!”, announced with such exasperation by Gus. An amusing, thoughtful and entertaining evening. Gus and Ben, two hit-men, await their next job in a derelict building – but what is the cost of their quest for meaning?